Things are gradually finding their place inside the ship. Everything is now aboard, and slowly being put together or stored. 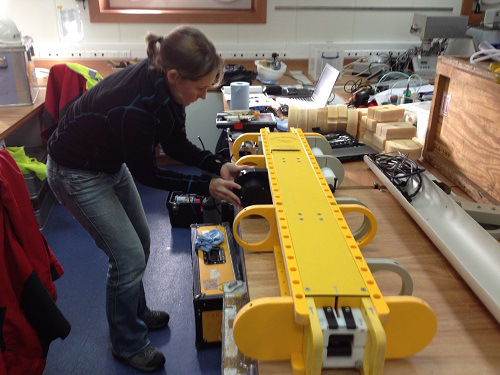 Jo Hopkins (from the National Oceanography Centre in Liverpool) is putting together the wirewalker mooring. This is a device that uses wave action to crawl up and down a wire between the seabed and the sea surface. 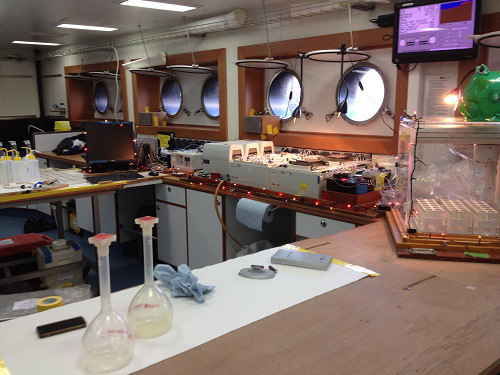 As it does this, instruments on it measure the water temperature, saltiness, and the amount of the microbial plants (the phytoplankton) in the water. The wirewalker doesn’t work if the sea is flat calm, which we suspect won’t be a problem on this cruise. Malcolm Woodward (nutrient chemist from Plymouth Marine Laboratory) has, perhaps a little early, got into the Christmas spirit. His nutrient autoanalyser and its control computer are festooned with flashing coloured lights. We are all keeping a wary eye on the weather forecast. Looks to be fairly good still for the first day, which will at least allow us to get out to the first sampling site in the middle of the Celtic Sea. After that the wind is forecast to pick up, but it doesn’t look like it’ll be strong enough to worry us for a few days. At the shelf edge, and rolling….